Forget flashy interfaces and mammoth applications. If you want the best audio media player for Windows XP, get foobar2000. Its base functionality is impressive, but one can further enhance this through plugin components. I don't think there's a file format this won't play, nor a device it won't support. Here I'll look at some of my favourite components and configuration tweaks. Installing components is as easy as throwing the DLL file into the components folder of the foobar install. For example, I utilise the ASIO support so I can get low latency streaming out of my Fireface 400 while maintaining compatibility with other playback software. Want to play MIDI, game files, MODs and other fun stuff? Well, have no fear, kode54 has you sorted. Direct CD burning works so long as you have Nero installed. But here's a hint for those of you who want to save money: install the Nero demo. Even once this expires, burning from foobar will still work, since the required library files are still present. 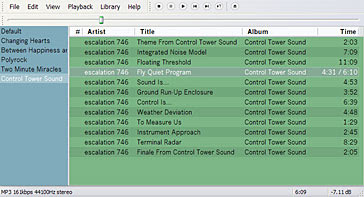 Just about everything in your foobar universe can be configured to your taste from the File menu under Properties. For example, in "File Types" you can select the file extensions you wish to associate with foobar. I suggest you do this immediately to ease integration. But please note that as originally configured, double-clicking a media file from Explorer will open foobar at the last used playlist, overwriting this with the file you clicked on. I doubt this is the behaviour you want. To fix, look under "General" preferences, in the "Commandline" area. Check "Always send to playlist" and choose "Default" or some other preferred name. Clicking a media file will now open it in that playlist. Alternatively, open foobar as an application to have it default to playback at the last position. A handy combination! Out of the box there's another annoying lapse in interface. The spacebar does not start/stop playback. But it's easy to fix this. In "General - Keyboard Shortcuts" click the "Add New" button. Then, in the "Key" entry field tap the spacebar. In the "Action" area, scroll down the tree to "Playback" and then "Play or pause". Voila! The default interface is ok, but install Columns UI for a more robust implementation. This gives you a list of your playlists down the left panel, with the contents of each in the right panel. The possible customisation of the display is extensive, though a little involved. You can get help in wiki format. (Do note that some of the screenshots are for an older version of foobar, and the configuration interface has changed quite a lot.) Also useful is the syntax for Titleformat. A good source for components of all descriptions is this Finnish site. You can browse by type and filter by software version. I'll write more about foobar soon. Thanks for the tip to avoid overiding playlists. That behavior was really annoying. Can this player use SQRsoft Advanced Crossfading and DFX? If it has an alternative crossfading feature, does it crossfade to the beat?